This original design for birders shows three less-than-ideal weather forecast icons, light rain, heavy rain & snow. The text reads The forecast is always perfect for birding. 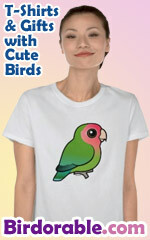 A great gift for birders!